Teddy Rosalie, Cordelia, and I are going on a very special meet-and-greet! I’ll tell you all about it when we return next week. Meanwhile, if you get bored, you can always check the archives (see the drop-down menu on the right side of this page). ‘Night, all. I have packing to do! This entry was posted in Not Cordelia's Mom, Relationships, Road Trips & Cars, Teddy Rosalie and tagged blogging, Cordelia's Mom, meet and greet. Bookmark the permalink. I have a guess. Be safe CM. And if you are meeting one of those bloggers you met online be extra careful. You never know about those people! Yes, this particular blogger could be quite dangerous. Wish you were closer – I could have invited you to the party! It will be. I’ve been looking forward to this particular meet-and-greet for years! I’ll look forward to that post when I return, Yvette. And I hope you find some of my better archived posts! Thanks, Trent. I’ll have my people with me. We smiled the entire weekend. I’ll be doing the follow-up post soon. Drive safe CM, Rosalie will make a great co-pilot. Always, Paul. 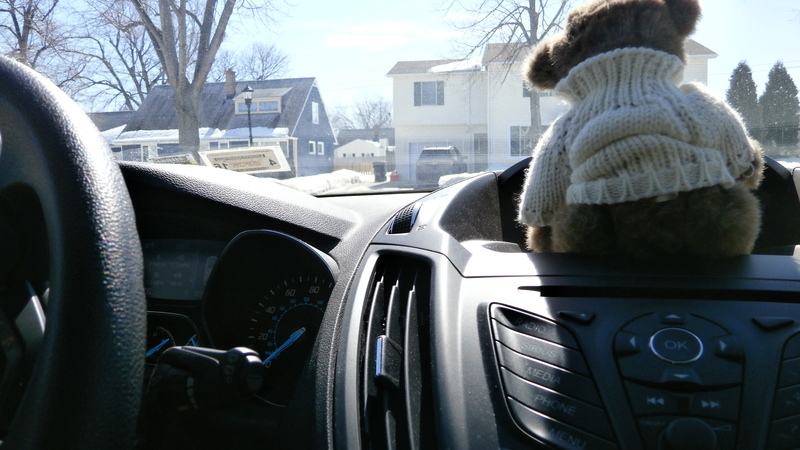 But I had to depend on Cordelia to navigate because Teddy Rosalie was too short to see out the windows once strapped into the passenger seat. Have fun! And say Hi to Cordelia for me, will you? We did. And I did. Hugs, Karen.